Scotland’s Lord President, Lord Hamilton. 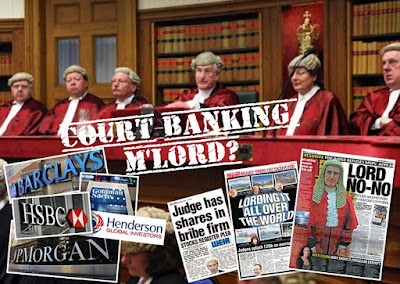 QUESTIONS are being raised over the ‘draconian’ conditions Scotland’s Chief judge, Lord Hamilton, wishes to impose on the use of McKenzie Friends in Scottish civil courts, after it was revealed today by the English Courts system, their own guidance on the usage of McKenzie Friends comes nowhere near the severity of Lord Hamilton’s requirements as noted in his recently released plans to impose harsh qualifications on anyone wishing to assist an unrepresented party litigant as a McKenzie Friend in a Scottish court. 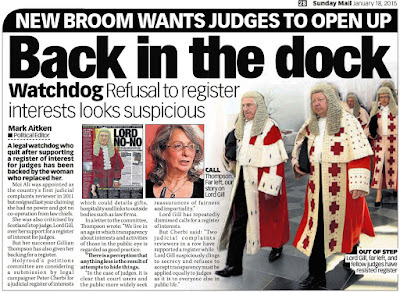 The response from the English courts service contrasts stunningly with the ‘draconian’ plans of Lord Hamiltion, which I reported in an earlier article, here Exclusive : McKenzie Friends for Scotland ‘are go’ as Lord President yields to Holyrood access to justice petition for Scots court users. 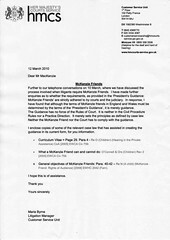 While the English courts have found themselves able to work, informally, within their own guidance on the use of McKenzie Friends in England & Wales as laid down in the Family Courts, Lord Hamilton plans to force Scottish McKenzie Friends to sign certificates before the court will even consider allowing them in to assist an unrepresented party litigant. 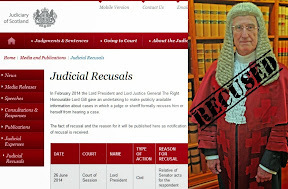 A political insider at Holyrood today commented on the sharp difference of practice on McKenzie Friends revealed by the English courts service saying he believed the Lord President would have to water down his proposals to fit in with the rest of the country. 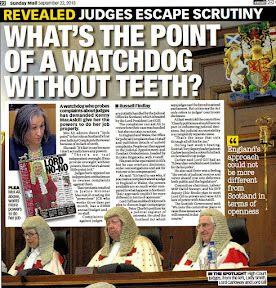 A solicitor in favour of allowing McKenzie Friends in Scotland commented : “The court is hardly effective at policing members of the legal profession who regularly appear in court, and they are supposedly bound not only by the rules of the court but also their professional conduct & service requirements. 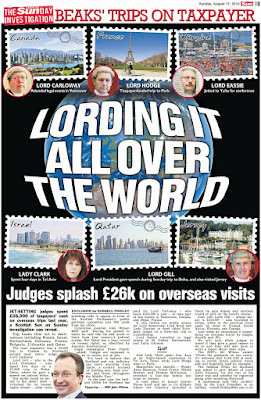 A senior official from one of Scotland’s consumer organisations also commented on the HMCS letter to the petitioner, claiming Scots were being left far behind their English counterparts on the McKenzie Friend issue simply because the Scottish legal profession were ‘too used to owning courtroom presence’. The Scottish Parliament during its last hearing on the McKenzie Friend Petition, had resolved to ‘put on hold’ any further discussion on matters until its May hearing, but in the light of the new developments of the HMCS response, consideration of the content and further responses expected to Holyrood in the next few days, along with written representations from MSPs who have also raised questions over Lord Hamilton’s plans, has caused the Petitions Committee to bring forward further debate on the McKenzie Friend petition to its meeting on the 20th April 2010. Labels: access to justice, HMCS, Kenny Macaskill, Lord Hamilton, McKenzie Friend, Petition 1247, Scottish Government, Scottish Parliament, Which? 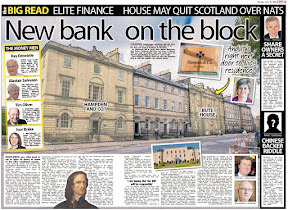 Law Society of Scotland accused by its own members of not being democratic. SOLICITORS CLIENTS in Scotland have known for years, the Law Society of Scotland are, to put it mildly, a rather undemocratic organisation when it comes to taking into account the views of up to 5000 clients a year in dealing with regulatory issues & complaints against solicitors, with most complaints receiving what is commonly known as the ‘whitewash treatment’, where solicitors facing even the worst complaints would still remain in a job, no matter how severe the offence, or how severe the financial loss to consumers. However, only now with the advent of a new legal services model for Scotland, where consumers may actually have the right to choose a non-lawyer to represent their legal interests, do solicitors find out the Law Society’s ‘undemocratic streak’ works both ways, after yesterday’s ‘vote nobbling’ of the Special General Meeting called by the Scottish Law Agents Society, where over 3000 'proxy votes’ cast by solicitors mainly it would seem, against the Law Society’s support of the Legal Services (Scotland) Bill, were put aside, because the Law Society knew it would lose the vote. So, its only taken since 1949 .. some sixty years late, for solicitors to come out and call their own governing body undemocratic, and unwilling to listen to its own membership. Well .. all I can say to that is welcome to the real world. 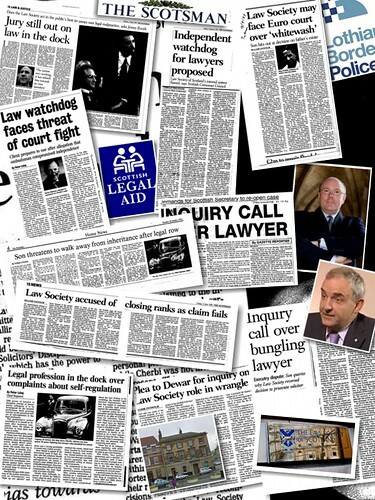 Clients have felt maligned by the the Law Society’s ‘lack of democracy’ for decades under the society’s self regulation of the legal profession, where clients who had the need to complain of poor service or otherwise from their legal representative consistently had their complaints, views, evidence and pleas for help cast aside by Drumsheugh Gardens time after time after time .. a well worn path by the Law Society, and now the Scottish Legal Complaints Commission, which continues to this day. 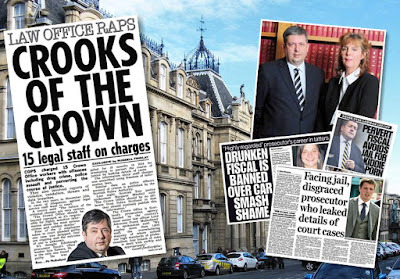 Tell me, members of the Scottish legal profession .. where were all your protests when clients suffered a raw deal at the hands of the Law Society ? Is that a pin I hear dropping ? Seriously, over the years of writing my blog, some solicitors have come to me saying things along the lines of “all this must end”, “self regulation has to go”, “we know we would be better off without the Law Society of Scotland” … but not once have I seen headlines in the newspapers of something along the lines of “Solicitors challenge their own Law Society to give clients greater say over complaints”. If such a move had taken place, believe me, members of the legal profession, you would have had much greater respect from the Scots population many years ago. Where only now, that certain quarters of the legal profession itself are realising their dominant control of Scotland’s legal services market is threatened, do we see solicitors protesting against their own governing body … not for the best interests of clients (although I’m sure some claim that is exactly what they have in mind) .. moreover the protests are about money, and the loss of it. Its just not good enough. 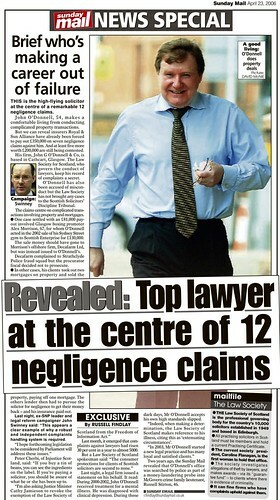 As solicitors, you all have yourselves to blame for the mess you are in, which ultimately clients will have to pay for. 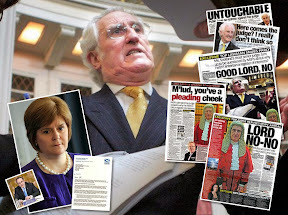 Decades of confrontation with clients, decades of lies, deceit, decades of arm twisting Members of the Scottish Parliament, and their Members of Parliament at Westminster before them into watering down or killing off proposals to reform regulation of the legal profession, reform of rights of audience, reform of court procedures, reform of civil & criminal law, and now, reform of the public’s access to justice, has given the public a view of the legal profession which will never change .. that of a selfish, manipulative, corrupt, anti-client, anti-consumer monopolistic business who will stop at nothing to protect its own interests. Clearly the Law Society knew it would lose the vote, so, simple way of dealing with that is to stop the vote. Yes, a good show for democracy there, but as consumers we have all experienced this same policy where the Law Society deals with thorny issues .. simply kill discussion, kill reforms, kill any chance of public debate. 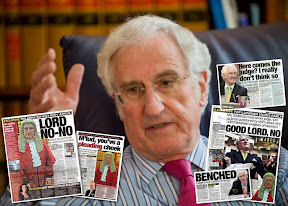 Law Society insider James Ness, famed for nobbling a Committee decision to send Borders solicitor Andrew Penman to the SSDT announced the vote would be cancelled. 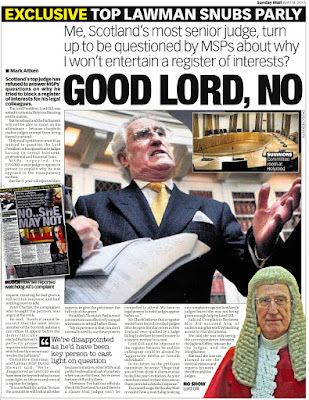 The opposing view from the Scottish Law Agents Society, revealed, amazingly, that James Ness, whom readers may remember, represented Scotland’s most famous crooked lawyer, Andrew Penman, before the Complaints Committee back in 1994 and got him off the hook from some of the most serious complaints imaginable, announced the vote proposed by the SLAS would not go ahead. Well, there’s a surprise ! 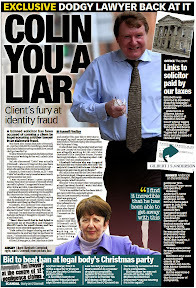 So the shadow of crooked Borders solicitor Andrew Penman is still playing a hand in obstructing consumer reforms to legal services, and at the same time cancelling a vote by lawyers against their own Law Society of Scotland. 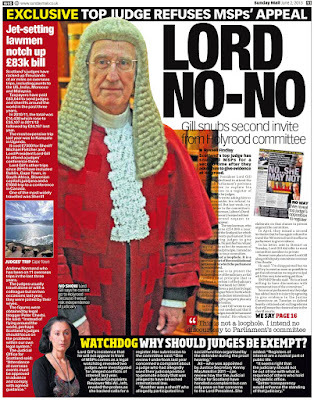 Law Society of Scotland’s meeting washed out with no vote. 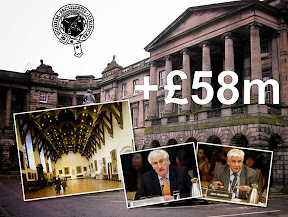 It will come as little surprise to most that today’s Special General Meeting of the Law Society of Scotland, called by the Scottish Law Agents Society to vote on the Law Society’s own ‘alleged’ support for the Legal Services (Scotland) Bill, turned out to be less of a confrontation, rather more the expected fudge predicted by many, as well as a complete washout in terms of furthering consumer’s wider choice & access to legal services in Scotland. Rather than the imminent break up of the Law Society, hoped for by some in the legal profession (and many outside it), the adjourned SGM at Murrayfield ended up agreeing to seek more talks on ‘building a consensus’ between those opposed to & those in favour of the Legal Services Bill’s proposals of alternative business structures, where law firms will be allowed via the new legislation, to bring in outside capital investment, and possibly end up being owned by non-lawyers (obviously a horrifying prospect to lawyers !). Law Society President Ian Smart - ‘not possible to reach agreement’. It was reported that discussions took place during an extended break and when the meeting resumed, Society President Ian Smart announced that although it was not possible to reach agreement on the spot, both sides were willing to keep talking to see if an agreed position could be found and the meeting was adjourned, amid protests the adjournment would remove the voices of around 3,000 solicitors who had sent in proxy forms to enable them to vote on the original SLAS motion, which called for the Law Society to change its stance over supporting alternative business structures (abs) in the Legal Services Bill – a stance the SLAS believe threatens independence of the legal profession. Cutting costs, giving consumers wider choice & rights to access justice & legal services is obviously a good thing for consumers. If solicitors are keen to compete with others offering legal services, then reducing fees, vastly increasing success rates & vastly decreasing the time it takes to conduct clients cases, or litigation, might help attract customers back to law firms. Competition is good .. and it might even raise standards in the profession, which the Law Society seem not to be able to achieve on its own. On closer inspection, Mr Smith’s argument holds little support outside the Law Society’s sphere of influence. “Consumers must be protected”. Speaking from the consumer’s point of view … Yes, consumers do need to be protected, from you & your colleagues, Mr Smart. However, only a fully independent regulator of legal services in Scotland can protect consumers from legal services, because the Law Society of Scotland and now the Law Society ‘ infected’ Scottish Legal Complaints Commission are just not up to the job. “Access to justice is a priority”. No its not. It should be, but its not, not anyway while the current legal services model exists its not. Access to justice under the current system, where solicitors & law firms dominate the legal services market is only granted to clients or consumers if a solicitor thinks they have a chance of making money out of their case, not just because someone comes through the door of a solicitor’s office and claims their rights have been violated, or they need to take legal action to resolve a difficulty, injury, issue of negligence, or require to be helped in some other way. “Legal Services is not and cannot be seen as a purely commercial activity”. Just why is that ? Do law firms offer legal services simply out of goodwill and without any regard to commercial factors and with no motive other than to serve the greater community at large, represent the interests of justice and fight vigorously for the rights of individuals ? Obviously not. Going to a lawyer and accessing legal services is (or at least should be) as commercial an activity as going to the post office to buy a stamp, or buying a train ticket and travelling from A to B. Legal Services is a business, Mr Smart. Get over it. However, until we hear the issue of consumer’s best interests being talked about in this debate, you can be sure the consumer & fee paying client, will always come last to the interests of the legal profession … leading to more concessions to the Law Society from the Scottish Government in the weeks to come as the Legal Services Bill travels through the Scottish Parliament. 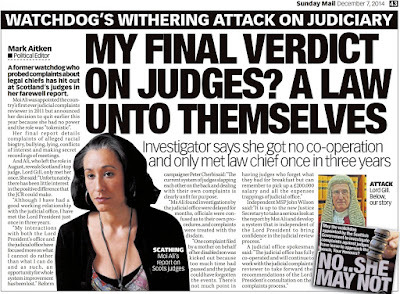 Funnily enough, the Law Society will then claim it was their work which ‘won’ the even more yet-to-announced, well rehearsed ‘concessions’ from the Scottish Government, and thus maintain its existence to fight another day …. Scottish Government backed down after threats from lawyers. 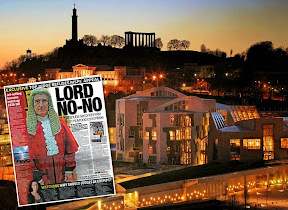 AFTER TWO WEEKS of bitter campaigning by solicitors who threatened to derail passage of the Legal Services (Scotland) Bill through the Scottish Parliament over certain powers which allowed Ministers to appoint non-lawyers to the Law Society’s ‘decision making’ Council, it has been revealed the Scottish Government has caved in to demands from the legal profession who want the Law Society’s ‘decision making’ Council to remain an exclusive lawyer-only affair. The sudden climb-down by the Scottish Government, who are now also expected to cave into more demands from the legal profession intent on watering down the Legal Services Bill proposals to retain their long held monopoly over the public’s access to justice in Scotland, come after an intense two weeks of campaigning by solicitors, law firms, and even the Law Society of Scotland, who, while officially supporting the Legal Services Bill, were privately threatening to kill off the bill’s chances of securing a successful passage in the Scottish Parliament, after it became known several MSPs had been contacted by Law Society officials & individual solicitors keen to see the bill would not accumulate enough support for its passage into law. Mr Ewing continued : "Following representations from the Law Society of Scotland, in which it re-affirmed its commitment to lay appointments, I no longer consider it necessary for Scottish Ministers to have this fall-back power. 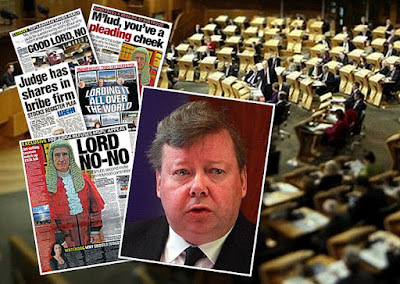 Therefore, I intend to bring forward an amendment at Stage 2 of the Legal Services (Scotland) Bill to delete section 92(4), (5) and (6) of the Bill." Mr Smart seems to think the way in which Scottish solicitors fleece the public with expensive, poor quality legal services should not be treated as a purely commercial activity, rather he casts up these non-existent ‘core values & principles’, of what one may ask ? What values do solicitors have these days when consumers have a better chance of winning the Euromillions lottery than finding an honest law firm in Scotland who wont rip them off ? 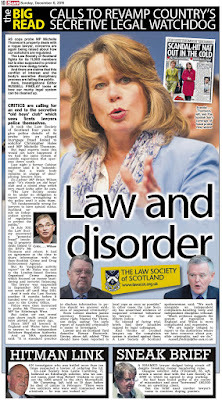 Law Society wins the day again after the usual threats of a split & intimidation of Scottish Government. 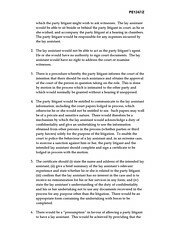 Section 92 of the Legal Services Bill had required the Law Society to appoint a number of non-solicitor members to its Council to represent the public interest - a joke, surely as the Law Society have never represented the public interest. The now withdrawn proposals would also have allowed Scottish Government Ministers after ‘consultation with the legal profession, to set limits or requirements on how many non-solicitors would sit on the Law Society’s Council. 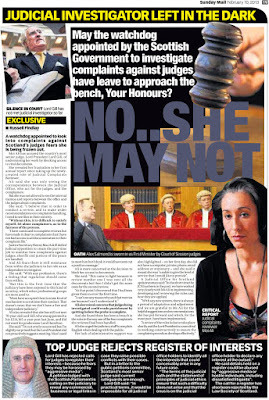 The proposals drew bitter arguments from within the legal profession, which boiled over onto television with arguments between the Law Society’s current president, Ian Smart & Mike Dailly of the Govan Law Centre, who along with several other law firms aligned to the Glasgow Bar Association threatened to split from the Law Society over the issue of control of the Law Society’s Council and perceived Ministerial interference, which it was claimed, would lead to a fundamental loss of the legal profession’s independence. Law Society wins the day again after the usual threats of a split & intimidation of Scottish Govt. 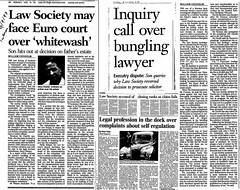 While it may look to some the bitter arguments between lawyers & the Law Society threatened to disturb the ‘harmony’ of the legal profession, seasoned observers are well used to these kind of tactics, where part of the profession will break off in an outburst against Government proposed reforms, while the Law Society feigns support to a certain degree for the disputed Ministerial plans. 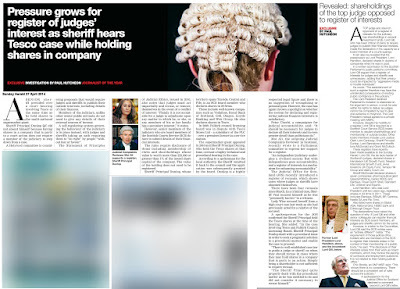 A few days or weeks later, the plans are then quietly (or as in this case, spectacularly) dropped by Scottish Ministers, allowing the legal profession to regain its harmonious outlook of ripping off consumers and getting away with it. Scottish Legal Complaints Commission : ‘A Government Agency’. 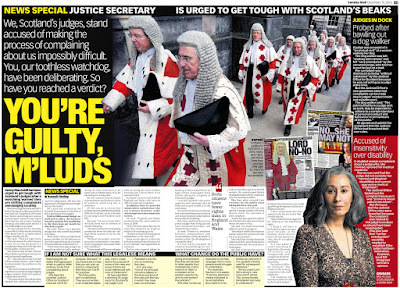 Earlier this week, the Scottish Legal Complaints Commission was even dragged into the fight against the Legal Services Bill by lawyers desperate to retain their monopoly over regulation of complaints and the public’s access to justice, when the Law Society’s Chief Executive Lorna Jack launched attacks at the hapless law complaints quango, branding it a “Government Agency”. 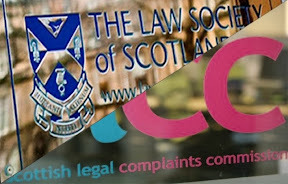 Replying to Ms Jack’s outbursts against the SLCC and pleas for solicitors unity, Mike Dailly of Govan Law Centre said the Law Society should combine with the Scottish Legal Complaints Commission in a new, slimmed down regulator, with representation left to existing & new professional associations. Personally, I doubt that could work, as Mr Dailly is simply proposing a Law Society take-over of the SLCC, which already appears to have happened without anyone particularly noticing …. ‘Consumer blueprint’ for future of civil justice in Scotland launched but how long must consumers actually wait for fairer deal on access to justice ? The principles underpinning Consumer Focus Scotland’s approach to civil justice are that the system needs to be user-friendly, affordable and accessible to ensure that when required users are able to enforce their rights and settle their disputes. 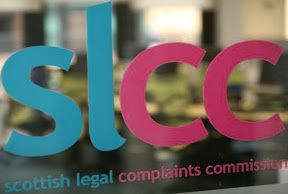 Consumers are more likely to lose out at the Scottish Legal Complaints Commission, after revelations board members & senior staff ‘hate’ complaining clients. 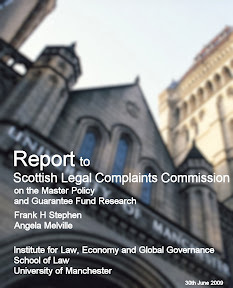 Actually not one individual who has contacted myself or the general media about the Scottish Legal Complaints Commission would back that statement up, and aside from any fiddled, seasonally adjusted, massaged or spun-out-statistics provided by the SLCC on their work to-date, the factual experiences of those dealing with the beleaguered quango support the notion the SLCC is more of a front for the Law Society than an organisation consumers should trust to regulate complaints against ‘crooked lawyers’. Both consumers and solicitors in general believe the SLCC has been a giant step backwards, as all the evidence to-date seems to indicate beyond any reasonable doubt. The SLCC is mired in scandal, indecision and extrudes an anti-client venom bordering on the hatred of consumers, which would rival the world’s most deadly, if heavily intoxicated snake. 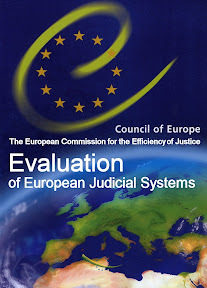 Step Three of the report, referring to an “Emphasis on Informal Means of Resolving Disputes”, puts forward ideas for alternative venues of dispute resolution outside that of the court, where consumers invariably end up in a tangled, complicated web of legal & court processes most view as being in place to defeat the individual’s access to justice. Law Society & Faculty of Advocates have always resisted reforms to increase consumers access to justice. All in all, not a bad report, but is this just another report after another report and another report ? Will the reforms being endlessly talked about actually happen this time ? For one thing, you can be sure the legal establishment and the legal profession, will fight many of these reforms all the way, tooth & nail, because many of these reforms amount to a loss of income to solicitors & law firms. 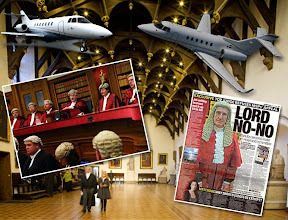 As we all know, the legal profession do not take kindly to losing out on ripping off consumers & clients as they have been used to doing in Scotland for .. well .. decades … and as just about every ‘reform’ for giving consumers a better deal against Scotland’s notoriously poor legal services market have been effectively butchered by whichever administration was in power at the time … well .. don't expect improvements anytime soon. Which? 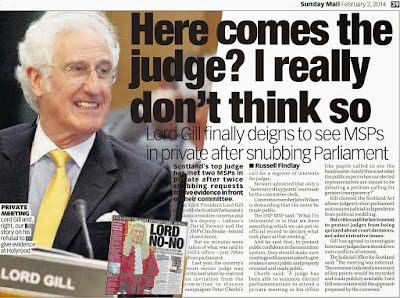 consumer survey backs up Lord Gill’s report. 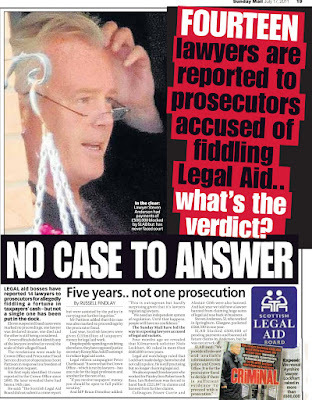 MOST CONSUMERS IN SCOTLAND want increased access to legal services with more informal means made available for dealing with minor disputes than can be obtained at present, reports new research carried out by the consumer organisation Which?, showing widespread support for the proposals contained in Lord Gill’s Civil Courts Review for updating Scotland’s woefully restrictive & inadequate legal services market, access to which is currently controlled & dominated by solicitors & the Law Society of Scotland. Which? research on legal services announced today. The results of the survey on legal services show that more than eight in ten (83%) people in Scotland agree that legal services should be easier to understand, and a similar number (79%) agree that they should be less formal and more user-friendly. More than eight in ten (83%) Scottish people think that a relatively informal method of dealing with small claims disputes about poor quality goods and services, with no wigs and gowns, and no need to hire a lawyer would be a suitable method. Should they need to settle a legal dispute about poor quality goods or services themselves, around eight in ten (79%) Scottish people would like to have the option of accessing less formal ‘problem solving’ courts where people could get redress without having to use a lawyer. 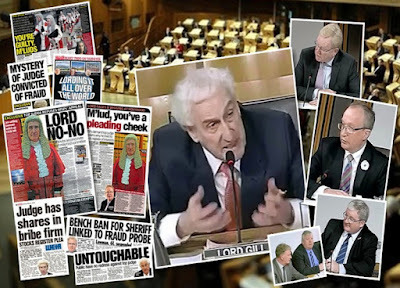 Lord Gill’s Civil Courts Review was highly critical of ‘Victorian’ Scots justice system. 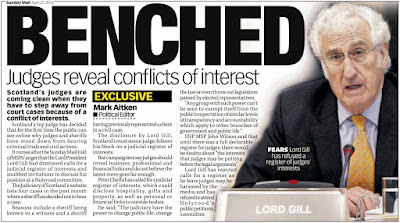 You can read more about Lord Gill’s Civil Courts Review, which detailed significant proposals to reform Scotland’s Civil Justice system in one of my earlier reports, here : Scots Law 'shake up' as Lord Gill’s Civil Courts Review supports McKenzie Friends, Class Actions & wider access to justice for all. 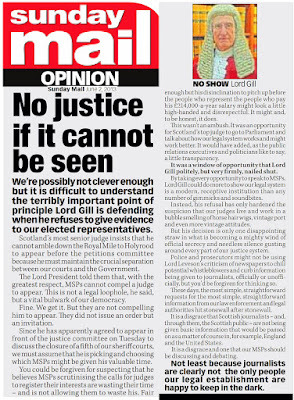 I would remind readers that while the Scottish Government and Holyrood are dragging their feet over Lord Gill’s highly critical review of Scotland’s civil justice system, some good has already come of it with the introduction of McKenzie Friends to Scotland’s courts, a much needed reform to access to justice which Lord Gill himself supports. You can watch video coverage of evidence given to the Justice Committee by the Consumer lobby & OFT, HERE and view the legal profession’s point of view on Scotland’s legal services market, HERE. 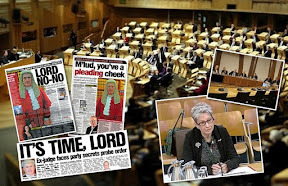 Holyrood’s Justice Committee were quick to listen to the legal profession, but excluded individual court users experiences on access to legal services. 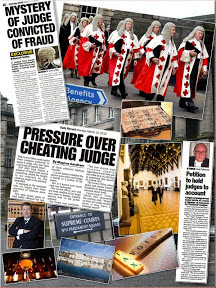 Sadly, the Justice Committee excluded members of the public from giving their own impressions & experiences of Scotland’s legal services market, which is a pity because if they had allowed ordinary members of the public in to testify, they would have gained first hand knowledge of how difficult & obstructive the Scottish justice system is to consumers & court users. 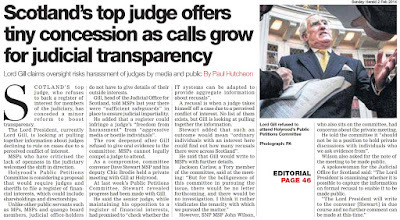 An official from one of Scotland’s consumer organisations agreed with queries put to him over the lack of any input from members of the public in the Justice Committee’s evidence sessions. I would urge all readers & consumers to support the passage of the Legal Services Bill, by contacting your particular MSP at the Scottish Parliament, asking them to support your choice of wider access to justice for yourself and all Scots. Make a difference and be part of the debate. 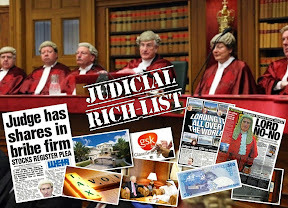 Make your opinion count, ensuring Scots consumer interests take precedence over those in the legal profession who have for far too long manipulated & controlled individual Scots access to justice for the profitable ends solely of the legal profession. 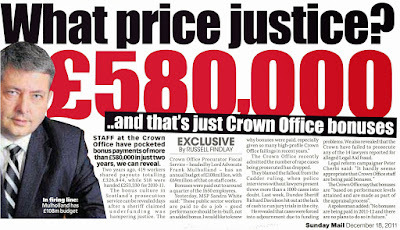 Its your justice system, you pay for it, make it serve you ! Labels: access to justice, civil courts review, civil justice, Julia Clarke, Law Society of Scotland, Legal Services Bill, Lord Gill, Scottish Government, Scottish Parliament, Which? Scottish Parliament supports legal services reforms. WIDER PUBLIC ACCESS TO JUSTICE in Scotland received a significant boost today as the Scottish Parliament’s Justice Committee gave their ‘cautious support’ to the Scottish Government’s Legal Services (Scotland) Bill proposals of opening up Scotland’s closed-shop monopolistic legal services market where for decades, consumers access to legal services & the courts has effectively been controlled by lawyers, advocates & the profession’s governing & self regulatory bodies such as the powerful Law Society of Scotland. In a report published today, the Justice Committee agrees to the general principles of the Bill, which aims to widen public access to justice in Scotland and allow new entrants into the lucrative legal services market such as banks, supermarkets & others who may well provide legal services to the public at a much reduced cost than currently offered by law firms & solicitors represented & regulated by the Law Society of Scotland. Justice Committee Convener Bill Aitken MSP. Holyrood’s Justice Committee Convener Bill Aitken MSP, speaking on the Committee’s report out today said: “This Bill will enable, but not oblige, the Scottish legal profession to enter into new forms of business that could create more competition and potentially offer consumers more choice in legal services. The committee’s evidence from the consumer lobby was in the main supportive of this Bill. The evidence from the profession itself was less supportive and in some cases fundamentally opposed to the Bill’s direction of travel. Little in the way of hard evidence …. someone obviously hasn't been paying attention to how the legal profession has been ruining clients and restricting Scots choice of legal representatives or access to justice for decades … which has already resulted in attempts through legislation such as the Legal Profession & Legal Aid (Scotland) Act 2007 to deal with some of that hard evidence some are now intent on ignoring. The extent of powers given to Scottish Ministers as a consequence of not establishing a new regulatory body similar to the Legal Services Board for England and Wales. 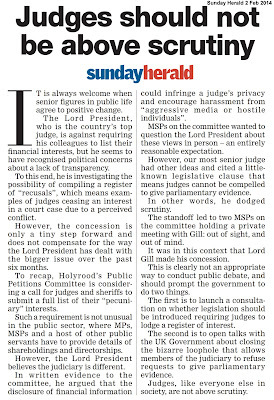 The potential lack of independence for Scotland’s legal profession when it is regulated by Scottish Ministers. The committee recommends giving the Lord President a greater role in the approval of regulators in order to address this concern. Reservations were also expressed by the Justice Committee on whether the “fitness for involvement” test contained in Section 49 of the Legal Services Bill is robust enough to regulate any outside investors, such as banks or supermarkets, as desirable institutions (or individuals) having financial stakes in law firms & legal services providers. 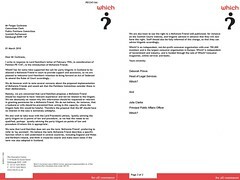 Factors for determining the ‘fitness for involvement’ include the investor’s financial position and business record, probity and character (including any associations) – factors which, if enforced today over many law firms I have reported on in terms of client complaints & poor service, would probably closed own several of Scotland’s ‘leading law firms’, if the true characters of some of these ‘leading lights of the legal profession’ ever became public. On the question of opening up access to advocates, the Committee agreed with the Scottish Government that “in a jurisdiction the size of Scotland and given the relatively small number of advocates, there is no need to impose alternative business structures on the Faculty of Advocates current business model” .. an issue at odds with the OFT’s findings and consumer experiences. The Committee also said “it is not aware of there being any significant degree of dissatisfaction with how the regulatory arrangements for advocates presently operate but nevertheless would invite the Faculty to consider what steps it might take to modernise its regulatory regime” – complaints against advocates, who would contemplate such a thing ! On a more hopeful note, the Committee felt that some parts of the Bill, namely Section 36 would unduly restrict the way in which voluntary or not-for-profit organisations can provide legal services. 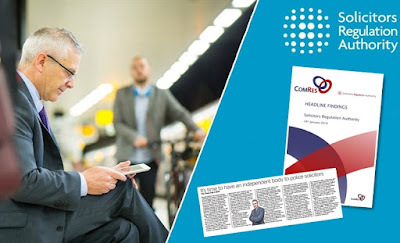 The Committee asked the Scottish Government to consider this point further after concerns were raised on this issue by Citizens Advice Scotland. Background : The Legal Services Bill has come about in Scotland after the consumer organisation Which? issued a “super complaint” to the Office of Fair Trading under section 11 of the Enterprise Act 2002, stating that the consumer interest was being harmed the restrictions on advocates' business structures, solicitors and advocates providing services jointly, third party entry into the market, and direct consumer access to advocates. 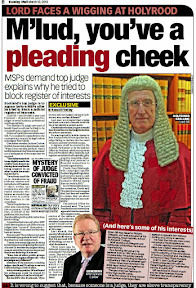 Justice Secretary MacAskill – no friend of independent regulation argument, It should be noted England & Wales already have the Legal Services Act 2007 in place, leaving Scotland trailing behind once again, simply because the legal profession north of the border has far too much influence over the pace of access to justice reforms. 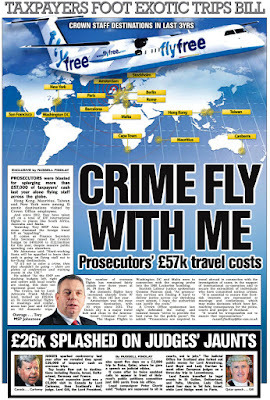 Missing from Scotland’s version is of course, the issue of independent regulation, where the current Justice Secretary Kenny MacAskill, seems to believe lawyers can still be trusted to regulate themselves – an obvious mistake, as lawyers have never been trustworthy when it comes to investigating complaints against their colleagues. 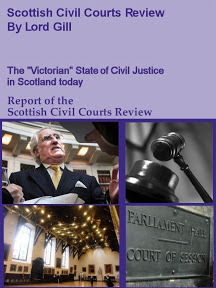 Over the years, many previous Scottish administrations including the present Scottish Government have dithered & delayed on giving Scots wider access to justice, while the legal profession put the brake on calls for reforms, even preventing enacted legislation from coming into effect, such as in the case of Sections 25-29 of the Law Reform (Misc Provisions) (Scotland) Act 1990, which allowed wider rights of audience in Scotland’s courts, but was held back by the legal profession’s seventeen year campaign to keep ‘outsiders’ out of courtrooms, while solicitors raked in exorbitant profits from clients who had no alternatives to turn to for legal representation. 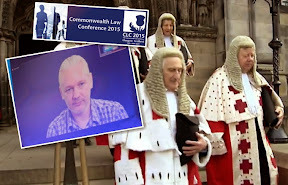 The Legal Services (Scotland) Bill was introduced in the Scottish Parliament on 30 September 2009 and referred to the Justice Committee, who received written and oral evidence from a range of sources all of which can be found on the Justice Committee web page. Labels: access to justice, Bill Aitken, Kenny Macaskill, Law Society of Scotland, Legal Services Bill, OFT, Scottish Government, Scottish Parliament, Tesco Law, Which? Law Society’s argument to maintain closed shop legal services weak. The debate on the Legal Services Bill, which aims to open up Scotland’s monopolistic legal services market, currently dominated by solicitors & the Law Society of Scotland, took another twist at the weekend with the appearance on television of the current President of the Law Society, Ian Smart & the Govan Law Centre’s Mike Dailly, where chiefly, the concerns of the profession itself were debated, rather than how consumers would ultimately benefit from long needed changes to the way we choose our legal representatives & access justice. A clip of the interview, from BBC Scotland’s The Politics Show, passed onto me makes for interesting viewing for all those concerned about how the legal profession wish to keep their business market stitched up as the long held monopoly which lawyers have been used to maintaining over the public’s access to justice. Both Mr Smart & Mr Dailly appeared not so interested in the lot of the client, (who is after all paying for them to offer legal services as a business, rather than some noble cause which serves the community) more the representatives of the legal profession, minus anyone from the consumer lobby, appeared to focus on the internal squabble for control of the Law Society itself, and its current dual roles of representing solicitors as well as regulating them, and of course its alleged claims to represent the clients best interests, claims which we all know to be .. well … a deceit. Law Society President Ian Smart & Govan Law Centre’s Mike Dailly on Legal Services Reform. From the debate I note Mr Dailly brings up the well known issue of supermarkets & banks price fixing their services & products. 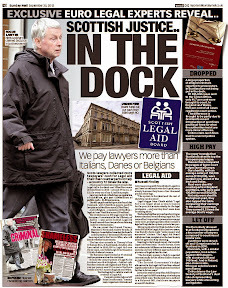 Well of course we all know the legal profession does exactly the same, and gets away with it time & again as there is no recourse to question solicitors bills (false, padded, or genuine) other than submitting the account to an almost bogus audit to the auditor of the court, who also usually happens to be a solicitor. I think we need less of those one sheet A4 letters with four lines of text on it, charged at £160+VAT each which solicitors are so famous for charging clients for (usually around 10 or more at a time over at least a year and nothing achieved in the client’s case) and more competition where consumers will be able to shop around for legal services rather than be ripped off by the current crop of … well .. for the want of a better term, qualified robbers ? Which? recently did a survey of consumers, supporting the notion that most Scots wish to see a more open legal services market, and be given freedom of choice on who represents their legal interests, rather than being forced to use a solicitor who can basically charge what they want (that old price fixing model solicitors have been used to all these years). For consumers to be able to trust & depend on legal services, independent regulation is a must, considering the disgraceful history of the Law Society of Scotland and now the Scottish Legal Complaints Commission on the subject of regulating complaints against solicitors. Sadly the Scottish Governments Legal Services Bill currently lacks any significant proposals for independent regulation of legal services in Scotland, as the Law Society seems to have easily arm twisted the likes of Justice Secretary Kenny MacAskill into backing away from that idea for now … but the campaign goes on to bring fully independent regulation to Scotland’s currently ill served legal services market. Labels: access to legal services, Govan Law Centre, Ian Smart, Kenny Macaskill, Law Society of Scotland, Legal Services Bill, Mike Dailly, Scottish Government, Which? Law Society of Scotland faces division over Legal Services reform. 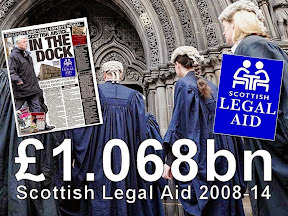 LEGAL SERVICES REFORM which would bring Scots wider access to justice is facing a new , if perhaps temporary hurdle as several solicitors & law firms who are upset over the plans contained in the Scottish Government’s Legal Services Bill, call for a break away from the Law Society of Scotland, who are now being accused of not representing solicitors best interests, by not protecting the ‘independence’ of Scotland’s legal profession – which actually translates into not protecting solicitors current monopoly over consumers access to justice. The Legal Services Bill, which you can read more about in my previous reports HERE, if passed by the Scottish Parliament, will effectively allow much wider competition in Scotland’s currently ‘solicitor only’ dominated legal services market, freeing consumers from being forced to use a member solicitor or law firm of the Law Society of Scotland to gain access to justice or legal services. In a reformed legal services market, banks, supermarkets and others will be able to provide Scots consumers with legal services at costs much less than those currently charged by law firms controlled by the Law Society of Scotland, who are now more widely known for their failures to represent clients best interests while charging huge fees for little work, than achieving actual successes for clients who often end up worse off than before they walked in the lawyers front door. 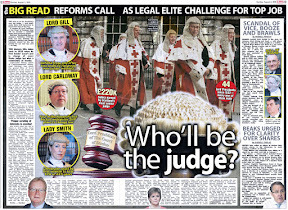 Those leading the call to split from the Law Society are the Glasgow Bar Association, the Govan Law Centre, along with two Glasgow law firms, MacRoberts & Thomsons , all warning that introducing Legal Services Reform to Scotland (the same reforms introduced in England & Wales during 2007 with much less fuss) will undermine centuries of independent legal representation in Scotland. While client & consumer protection appear very low down on the list of priorities in this argument which is essentially between law firms & the Law Society vying for control over the consumers right to choose their legal representative, the Glasgow Bar Association have now called for a referendum for all solicitors to decide whether the Law Society of Scotland should represent their interests. Clearly solicitors don't want anyone other than solicitors on the Law Society’s ‘Council’, although that would be fine with me if the Law Society were to be stripped of its regulatory & disciplinary role, and left to be nothing more than a representative union for solicitors, rather than the all controlling, all powerful, all crooked regulator it has always been. An official from one of Scotland’s consumer organisations branded the current debate ‘a diversion’ and accused certain sections of the legal profession from trying to obstruct reforms which would lead to greater consumer choice and protection from Scotland’s notoriously poor legal services market. Law Society President Ian Smart – independence is essential. The response from the Law Society of Scotland was to claim it had always promoted independence of the legal profession as being fundamental to its support of the Legal Services (Scotland) Bill. Mr Smart said : “In its response to the Bill and during parliamentary evidence sessions, the Society insisted that independence is essential and that the role of the Lord President should be strengthened to ensure that this remains the case. The Society will continue to lobby changes to section 92, which has been raised as a concern by both the Society and its members. 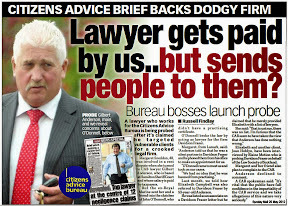 If solicitors are going to have a say in who represents them, without giving any regard as to who will represent the very clients who fund their ill deserved lavish offices & law firms, perhaps clients and consumers should also be able to have a referendum on who they want to regulate legal services and handle complaints against the legal profession. Which? revealed recently most want independent regulation of legal services. 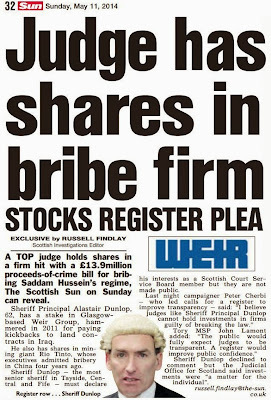 We already know from research which has already taken place on this issue, some of it dating back over a decade from the Scottish Consumer Council, to current research undertaken by UK consumer organisation Which?, consumers have always wanted a fully independent regulator of legal services in Scotland, rather than the half way, hapless, ‘just as crooked’ Scottish Legal Complaints Commission, which now ranks among most clients as Law Society MkII when it comes to dealing with complaints against solicitors. 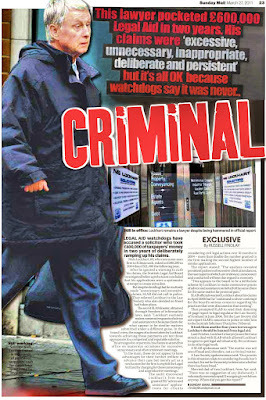 Labels: Ian Smart, Law Society of Scotland, Legal Services Bill, Scottish Consumer Council, Which?